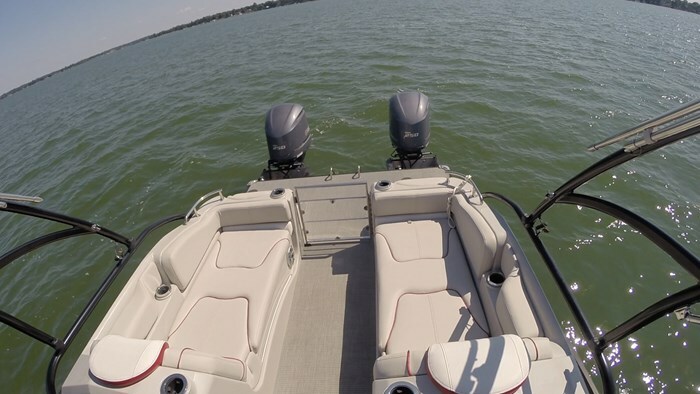 2016 Sylvan S5 Extreme - Double the Outboards - Double the Fun! Sylvan’s Signature or “S” series is meant to blend luxury, performance and comfort into one, fun-fueled, exciting package. When you add the Extreme Package you’re stepping all of those elements up to another element. You’re turning them up to “11”. Also if you get that reference then we can be friends. For 2016 there isn’t much new for the S5 that we tested - oh except that this was the first time they put twin outboards onto it, giving it 500hp total! So I guess you could say a lot is new! There was a time not too long ago where the 26-foot 10-inch length of the S5 would be massive for a pontoon boat but these big, bold pontoons have proven they’re here to stay and the S5 is proof. It’s the biggest in the Signature line-up but an average size in the grand scheme of things. Regardless of how much horsepower is on the back of it, the S-series is all about bold, eye catching styling with a sleek, always in motion look to it. With the use of black, anodized aluminum “D” railings that arch from bow to stern the S5 looks like it’s flying down the lake, even when it’s sitting still. The fencing panels are often black, like the model I tested, but you can also go with a clean white finish. Both are accented with a colour stripe that matches the flow of the railings. On the inside this accent stripe is matched by vinyl accents and in our case it was a maroon red colour that matched nicely with the white and grey textured, marine grade vinyl found throughout the S5. The layout on the S5 is simple, yet it is one of the most popular layouts in the entire Sylvan line-up. It features large, facing bench seats in the bow that have a chaise style backrest should you wish to lounge with your feet up. But should you have to share with guests there is room for many of them,14 to be precise in the entire boat. There are twin, high-back Captain’s chairs midship, one for the Captain and one for the companion. Behind these are large, bed style loungers that face aft. They’re surrounded by cushions and cup-holders so if you happen to choose this spot for your afternoon siesta I don’t think anyone is going to blame you, especially if you go for the optional filler cushions that converts the entire stern lounging area into a bed. With the twin loungers you get a center rear gate which I have found most people like the most. 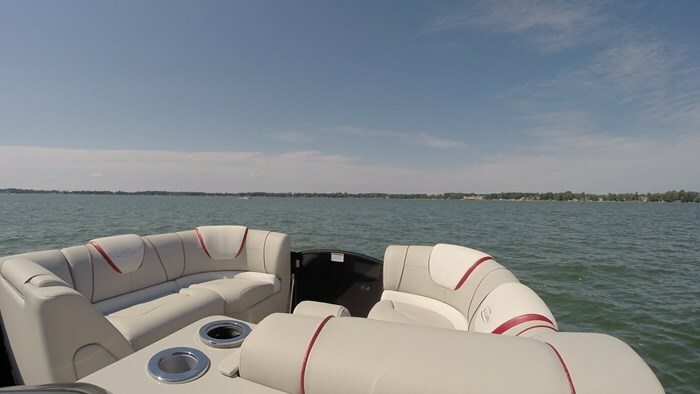 It creates an open flow to the boat and when you step through onto the large stern area on the S5 you’re going to see why this boat is so popular. It’s a watersports focused boat so having an area at the stern of the boat that you can get ready, store gear and simply hang out and swim is important and the S5 has all of the above. 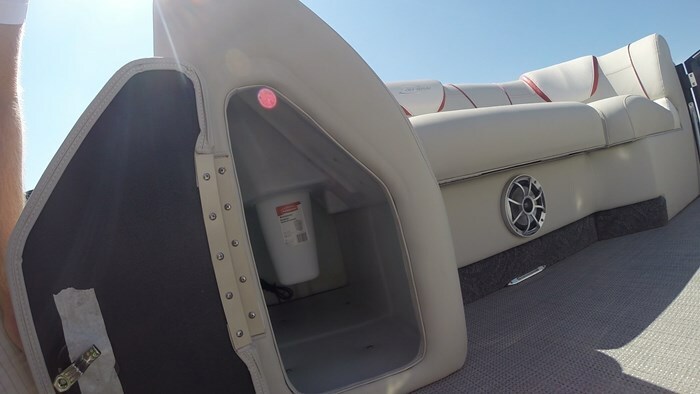 There are twin pod seats on each side of the center walk way that lift up, making them a great spot to store lines, fenders or wet gear. There is a ski-pylon for those slalom traditionalists, but if catching air is more your jam then that’s where the wake tower comes into play. 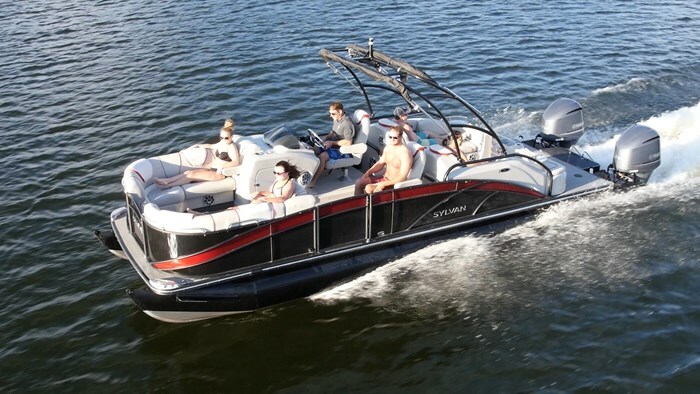 Sylvan isn’t the first pontoon company to put a wake tower on their boats but they’re one of the ones who does it proper. The tower comes down onto two support beams which bolt directly to the cross members of the S5. These cross members are .250 gauge “hat style” channels which are called that, because that’s what they look like. This design reduced the amount of flexing in the cross member which is going to be very important when you have a wakeboarder on a line 50-feet behind the boat attached to said tower. Back inside the boat it’s important that with a 14-person capacity that you have plenty of storage and the S5 certainly has that. There is storage in almost every spot imaginable in the boat. The bow cushions pull and flip forward to give you complete access to the storage inside which will allow you to store larger items. There’s storage in the back rests including a hidden trash receptacle. 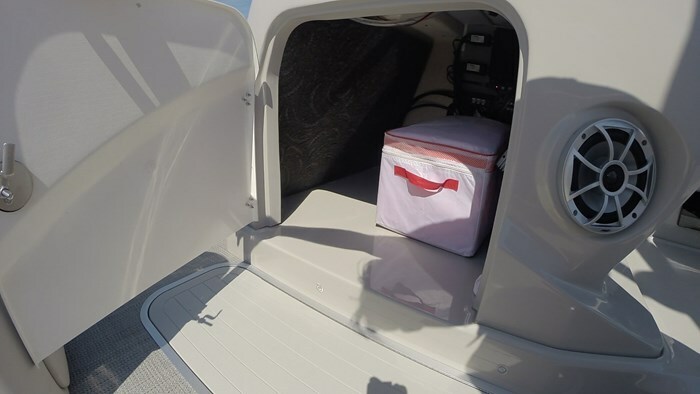 The optional ski locker in the third pontoon is always a great choice and under the helm is a compartment large enough for an igloo cooler. But enough lip-service about the boat itself and let’s get to the real highlight - the twin 250hp Yamaha Four Stroke outboards! What Sylvan did to accommodate such horsepower is they took their center pontoon and put two of them on the outside, with a regular pontoon in the center. That’s about it. The point I’m making is that they wanted to show their boats are already built well enough to handle the horsepower increase. They didn’t have to double anything up, add extra bolts or tougher welds. They already DO that. So it was just simply a matter of having two pontoons with transoms on them. Not all pontoon manufacturers can say that. As I went to test a hole shot of the 500hp S5 I gripped the wheel a little tighter and braced for something special, and I wasn’t disappointed. Before I knew it I was at 40 mph, almost instantly. The power hook up on the outboards was immediate and the S5 sprung forward with a shot. But I also noticed how the frame of the boat stayed solid, no twisting, rattling or compromising. That’s confidence inspiring. It’s a funny thing, going fast on a pontoon boat. The better the boat is built, the slower you feel. What I mean by that is you don’t feel like you’re going fast because the ride is so smooth and stable. But I had to look down to see I was doing over 45 mph and backed the throttles down to a comfortable cruise of 36 mph at 4000 rpm. It was also right at this mid-range RPM where the motors harmonics sounded like music. Outboards are tuned so that their engine revving compliment each other when in multiple engine situations and when done properly it’s a thing of beauty that any motor head can appreciate. So we established that the S5 is fast, (52mph top speed!) but that’s easy. Anyone can go fast in a straight line. It’s cornering and holding speed that’s hard. For the S5 that was a walk in the park. I pulled back a bit more on the throttles and turned the wheel hard starboard. The S5 responded by digging in an coming around faster than I have seen some runabouts. I straightened out and turned harder port, applying more throttle and the 500 hp almost bullied the S5 around rail tight with pinpoint precision. Pontoons are a unique thing. Just when you think they’re meant for slow cruising, you add lifting strakes in the right spot and add some horsepower and they amaze you in ways you never thought possible. But to get real for a second. As cool as the S5 is, I have been told by Sylvan that they’re not actively pursuing this avenue. And for good reason. They may only sell a couple a year so it’s not viable as a business. But what this does is compliments how well the S5’s are built that they can handle such a horsepower upgrade without question. 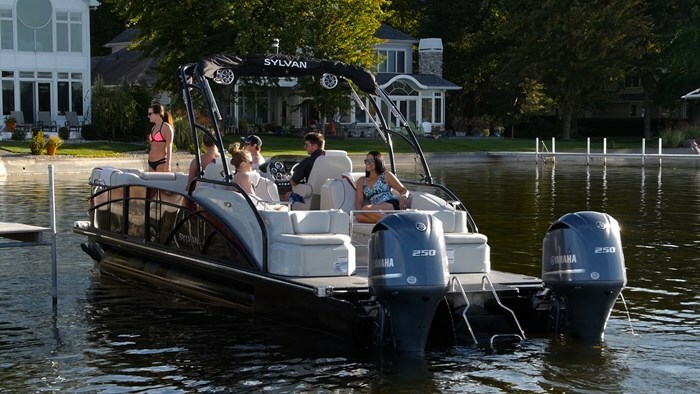 The beautiful thing is Sylvan puts the best it has into every boat it builds so while a twin outboard, 500hp pontoon may not be in your future, you know whatever Sylvan you choose that it’s built to the highest standards.